A double-blind, randomised, placebo-controlled study in 215 elderly nursing home residents showed that Lactobacillus reuteri Prodentis reduced the prevalence of oral Candida by more than 50 per cent compared to placebo. “The results show that Lactobacillus reuteri Prodentis may be beneficial in patients at risk of oral candidosis”, says Professor Svante Twetman, Department of Odontology, Faculty of Health and Medical Sciences, University of Copenhagen, Denmark. 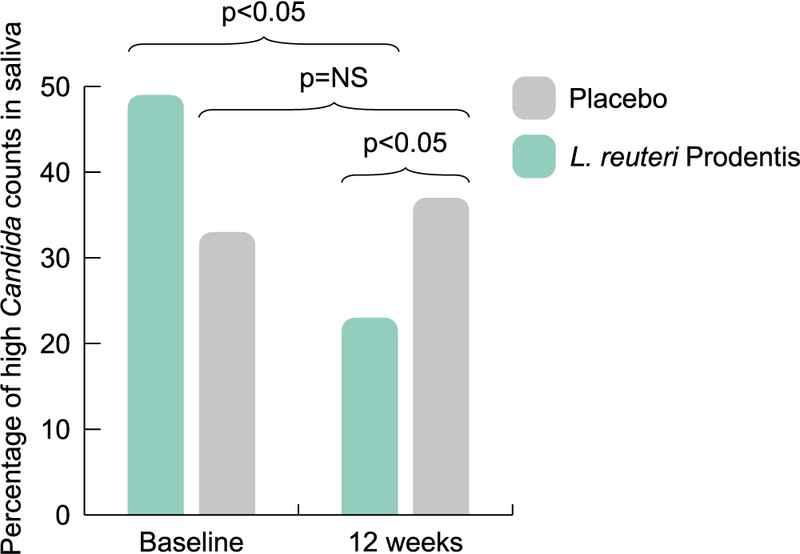 After 12 weeks of intervention with two lozenges per day of Lactobacillus reuteri Prodentis there was a statistically significant reduction of 53 per cent in the proportion of patients that had high Candida counts in both saliva and plaque in the probiotic group whereas there was no difference in the placebo group. Oral candidosis, or Candida-associated stomatitis, is common among the elderly and is often associated with factors such as antibiotic treatment, an impaired immune system, neglected oral hygiene and smoking. In frail elderly patients the condition may be more or less chronic or frequently recurrent and may require long-term or repeated antifungal medication with the risk of resistant strains. Furthermore, the long-term effects of antifungal drugs on the oral microbiota are unclear. ”As Candida affects a large number of our elderly population the new and positive results could make BioGaia’s oral health probiotic ProDentis an attractive alternative to conventional antifungal drugs”, says Peter Rothschild, President, BioGaia. The study was published in Journal of Dental Research 22 July 2015. Study facts are found here. BioGaia has published this information in accordance with the Swedish Securities Market Act. The information was issued for publication on 30 July 2015, 01:00 pm CET.